While there are a lot of mixed feelings regarding the use of popup plugins, they still continue to be a super efficient tool for growing your email subscribers. 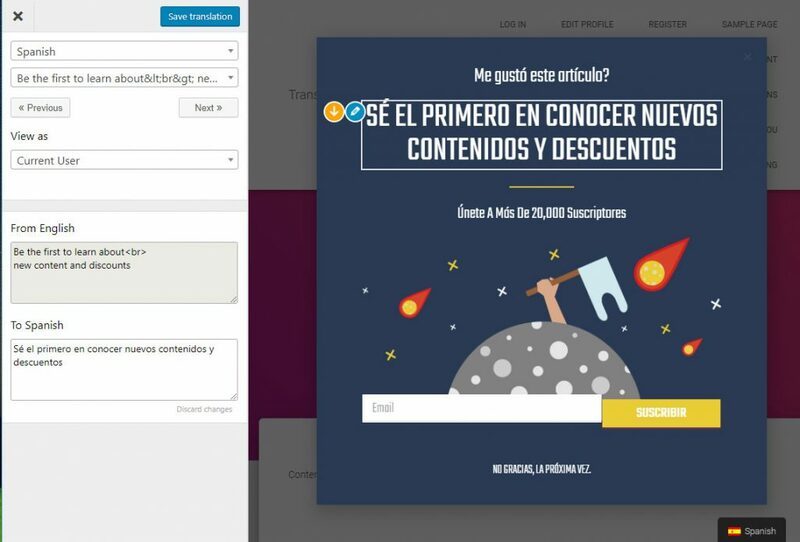 If you’re running a multilingual site though, figuring out how to translate popup content can be quite challenging. That’s because finding a solution that works independent of the popup solution you’re using is not straight forward. 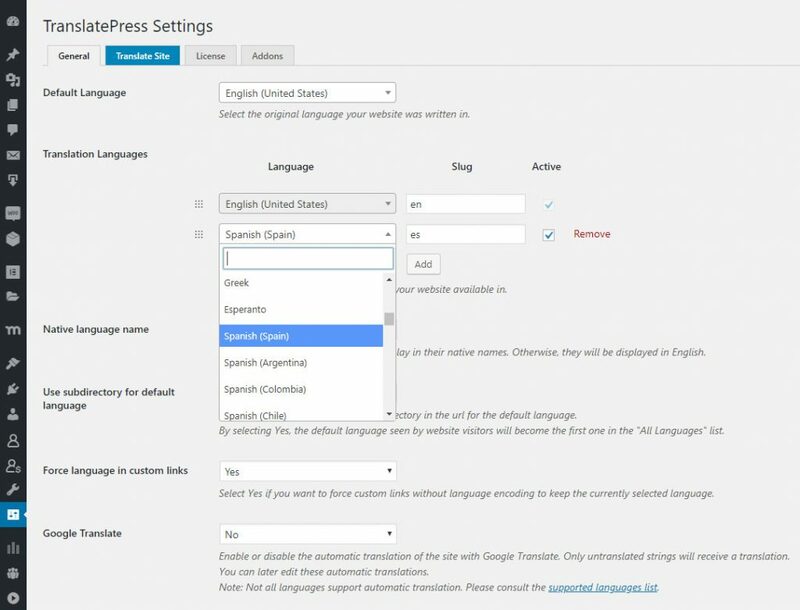 Most WordPress translation plugins need to add compatibility for a certain popup plugin in order to make its content translatable, while others simply won’t work. Since there are a ton of pop-up plugins to choose from, it’s easy to get lost. Due to its front-end translation interface TranslatePress will help you translate popup content independently of the tool used to create it. The same goes for forms, WooCommerce products or Gutenberg blocks for that matter. Below we’re going to go into the exact steps needed to translate the content of any popup into multiple languages. First, we’ll install TranslatePress. After activating the plugin, you’ll notice a new “Translate Site” item added in the admin bar. Just hover over it and click “Settings” (or you can click the “Settings” menu item and select TranslatePress). This will take you to TranslatePress Settings page. Here we can add the languages in which we want to translate the popup content. English is our default language, and we’ll also add Spanish. There are a few other settings (like integration with Google Translate for automatic translation), but we’ll skip them for now and click “Save Changes”. In this tutorial we’ll create a lightbox popup for collecting user emails. The popup will be set to show up after the users scrolls a significant portion (~80%) of your article, it’s clearly engaged with your content and there’s a high change he will want become a subscriber. 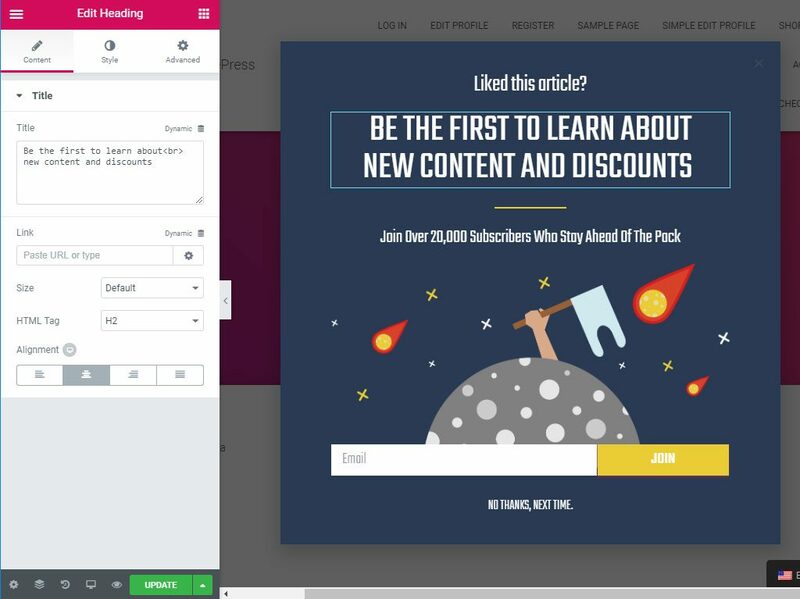 For this we’ll be using Elementor, the most popular page builder for WordPress that allows you to also create and integrate popups on your website. The Popup Builder is part of Elementor Pro. After installing and activating the plugin, in the WP Dashboard, under Templates select Popups. Then click “Add New” to create our first pop-up template. You can select from an predefined list of templates and customize it to your needs. 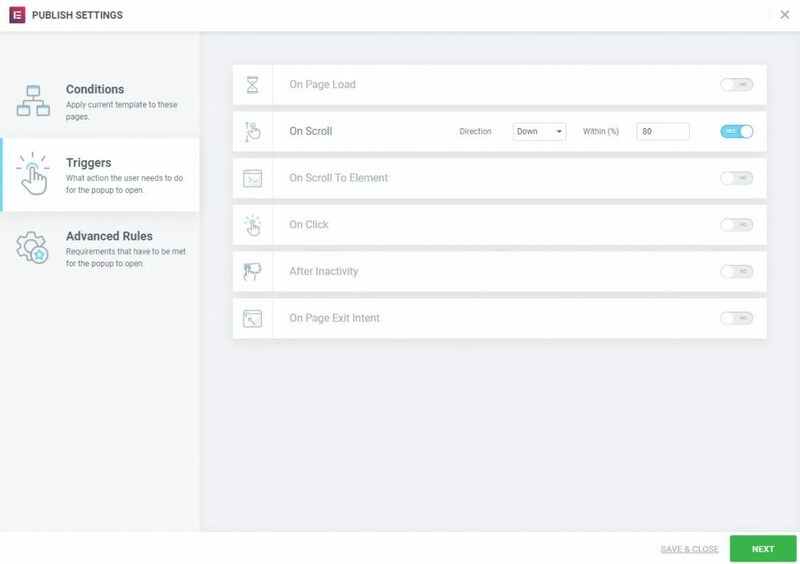 Once you’re satisfied with the created popup, you can hit publish and set the conditions, triggers and advanced rules for your popup. These settings will determine when and how the popup appears. Now that we’ve created the popup and added the triggers, all that’s left to do is to translate it. For this we go to Templates -> Popups, select the newly created popup template and click “Preview Changes”. This will open a preview of our popup. Now, from the admin bar click “Translate Page” and you’ll be prompted with a translation interface allowing you to translate the popup content. 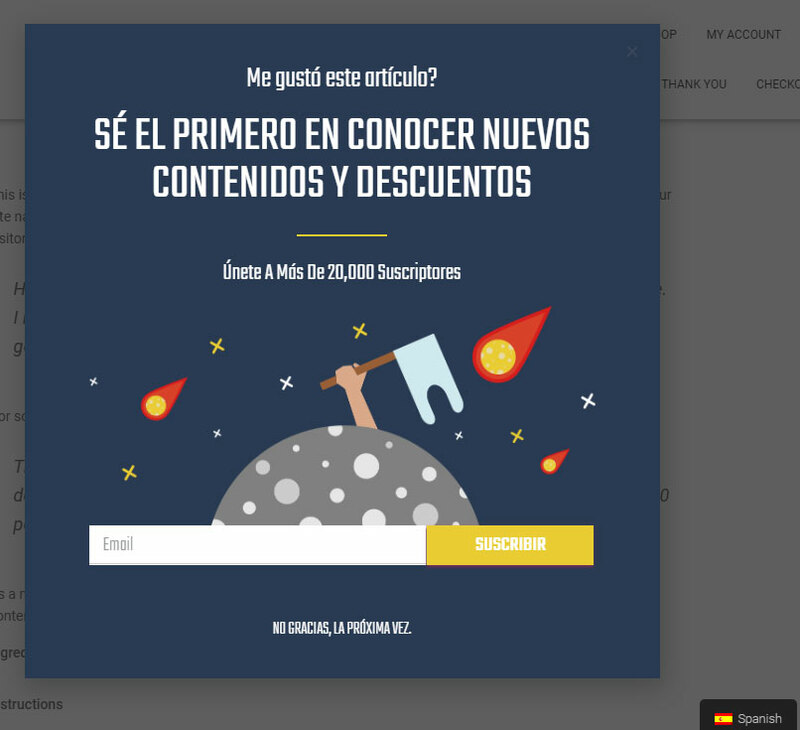 You simply select each popup text and enter its Spanish translation, then click “Save translation”. Once you’re done, close the translation window and start navigating the Spanish version of the website. When the popup appears, it will be translated. The same intuitive process can be used to translate any other type of popups.